LASEK (Laser Epithelial Keratectomy) is a corrective procedure that combines the many benefits of PRK and LASIK to create one of the safest forms of laser vision correction. LASEK is used to treat myopia, hyperopia or astigmatism. LASEK is a laser vision correction procedure that was developed to eliminate flap-related complications that can occur with older procedures. LASEK is one of the safest and most advanced forms of laser vision correction available to date. Your prescription must be within the operable range. People with flat or thin corneas or dry eyes may not be candidates for LASIK or other procedures, but may be able to have LASEK surgery safely and successfully. 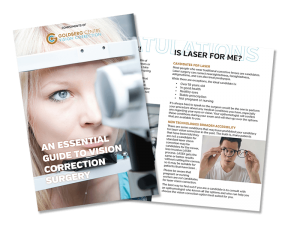 WHAT CONDITIONS CAN LASEK TREAT? Dr. Chaim Goldberg will personally examine you to see if you are a candidate for Laser Vision Correction and educate you as to which vision correction procedure is best for you. 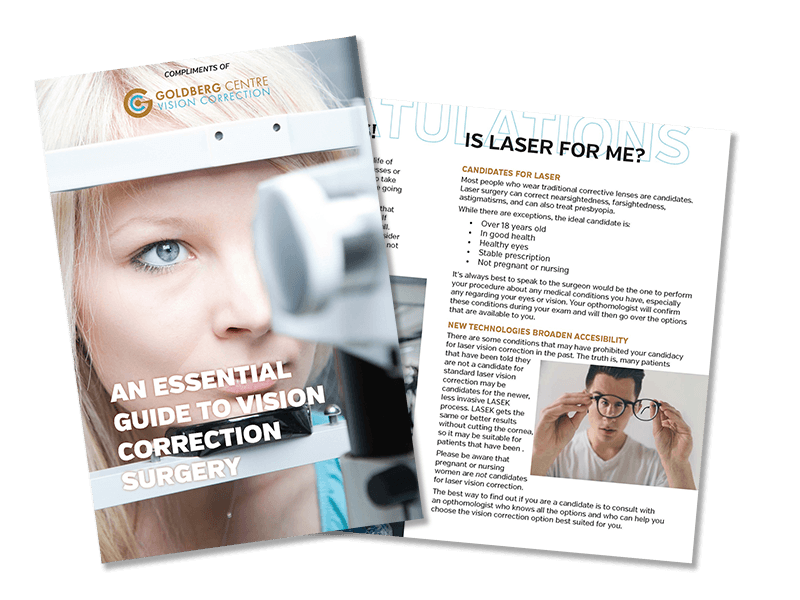 We invite you to book a consultation at the Goldberg Centre to determine which laser vision correction procedure is best for you. Dr. Goldberg’s procedure of choice is LASEK, primarily because of the enhanced safety associated with no cutting of the cornea. There is NO CUTTING and NO FLAP. The corneal FLAP of the LASIK procedure NEVER HEALS. It adheres or sticks, but never heals, and flaps can be dislodged years later! So if your lifestyle includes sports or your profession demands freedom from the encumberance of glasses or exposes you to potential eye trauma, LASEK may be ideal for you. There is no flap to dislodge. HAVE YOU BEEN TOLD YOUR NOT A GOOD CANDIDATE FOR LASIK? We encourage you to come for a complimentary consultation. Many people are happy to find out that LASEK is more successful for patients with higher prescriptions, thinner corneas, large pupils, or chronic dry eyes. And if your profession or your lifestyle exposes you to potential eye trauma, LASEK may be ideal for you. Because there is no cut and no flap, it heals completely and cannot be torn or dislodged. The Goldberg Centre is pleased to be adding two new tests to our clinic. The ORA and Avellino DNA Tests are invaluable screening methods for helping us improve the SAFETY of our patient’s health and life decisions. The Ocular Response Analyzer (ORA) is the only instrument in the world capable of measuring Corneal Hysteresis (CH); an indication of the biomechanical properties of the cornea. We are pleased to be able to offer our patients this next-generation technique for analyzing the cornea. For optimal laser vision correction results, the cornea must meet certain requirements for thickness, rigidity and strength. The ORA helps us achieve the best possible results from the LASEK procedure, as well as providing another tool to help us identify those who are good candidates for Laser Vision Correction. Avellino DNA Test is a cutting edge DNA test that provides fast, safe, and affordable evaluations of patients’ genetic pre-disposition that causes Avellino Corneal Dystrophy – also known as ACD. While ACD usually develops slowly, carriers of this genetic mutation are at an extremely high risk of accelerated opacity formations, should they undergo vision correction surgery. Fortunately the AGDS Test positively identifies with 100 percent accuracy if a person has the genetic condition. This test reduces the risk of patients with the ACD mutation having post-laser vision correction impairment and increases confidence that they are avoiding unnecessary harm to their vision. Keeping up to date with state-of-the-art technology is a direct reflection of our dedication that YOUR SAFETY is our absolute highest priority. As we age, vision gradually worsens when focusing on objects that are near. This is called presbyopia. Patients with presbyopia come to depend on reading glasses or bifocals to help their eyes focus on objects near to them. Unlike nearsightedness, farsightedness and astigmatism, conditions related to the shape of the cornea, presbyopia is believed to be caused by an age-related loss of flexibility in the lens of the eye.